Please mention Keith's Eden site when booking. We have 7 en suite letting rooms, which are separate from the main pub building and as such, you are free to come and go as you please. The pub is also open for lunch and evening meals daily. There isn't a word to describe Bosinver. Idyllic comes close, but even that can't conjure up the spectacle of dragonflies on the lake, a kingfisher darting through the woodland, wildflowers as high as your shoulder, towering trees and a profound peace punctuated only by the sound of birds. THE FARMHOUSE (right) sleeps 11 plus cot in six bedrooms. This genuine listed thatched longhouse, over 400 yrs old, is full of character but with modern conveniences. COLIZA (left) Sleeps 4 + cot Newly built pretty thatched cottage adjoining the entrance drive with far reaching views of the surrounding countryside. LABURNUM (centre) sleeps 8 Laburnum has a far reaching view across the valley, almost to the sea beyond. There are also 12 other cottages and a lodge to chose from, more info click on our website below. Beautifully located next to the South West Coastal Path, yet within walking distance of the idyllic village of Mevagissey and Portmellon Cove in peaceful and tranquil setting, a few minutes from the Lost Gardens of Heligan and The Eden Project. Perfect for visitors all year round to explore all that Cornwall has to offer. Guest rooms, all en-suite are well appointed and individually styled. Most commanding magnificent sea views. For special occasions why not stay in our junior suite with it's own terrace or one of the four poster rooms. Our restaurant shares the same stylish, relaxed atmosphere, offering a menu that adds variety and interest using locally sourced produce. 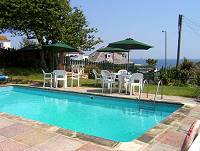 Other guests facilities include a lounge bar, outdoor heated swimming pool, sun terraces, garden and car park. Special packages include, luxury garden breaks, mini breaks and romantic breaks. 5 Comfortable stone built cottages, tastefully furnished, overlooking open countryside in one of Cornwall's Area of Outstanding Natural Beauty. 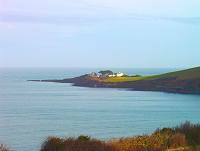 Ideal if you are looking for a 'get away from it all' holiday and value peace and tranquillity. 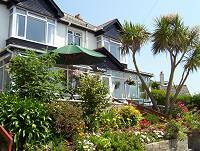 Cottages are ETC 4* set in a courtyard with spacious gardens.